God uses Operation Christmas Child to touch the lives of Philippine children living in dire conditions. It smells so strongly of trash and cow dung at the big garbage dump outside of Manila that most people hold handkerchiefs to their noses to block some of the smell. No one wants to visit this area. Muck swallows shoes, leaving people barefoot in the smelly mess. And yet there are people who live and work here. These people are lower-class Filipinos. They collect bottles and other pieces of trash to sell. Their houses sit right on the edge of the dump site and are made of trash. While most people crinkle their noses and want to leave, the dump people smile and laugh while the brown concoction on the ground squishes deeper in between their toes. The children in this area are quiet but happy. Boys run shirtless through small patches of grass with a soccer ball. Girls watch and giggle in their crisp, white school blouses and plaid skirts. They’ve just finished a day of school and walked home under the hot and sticky June sun. Today, the smiles are a little wider. 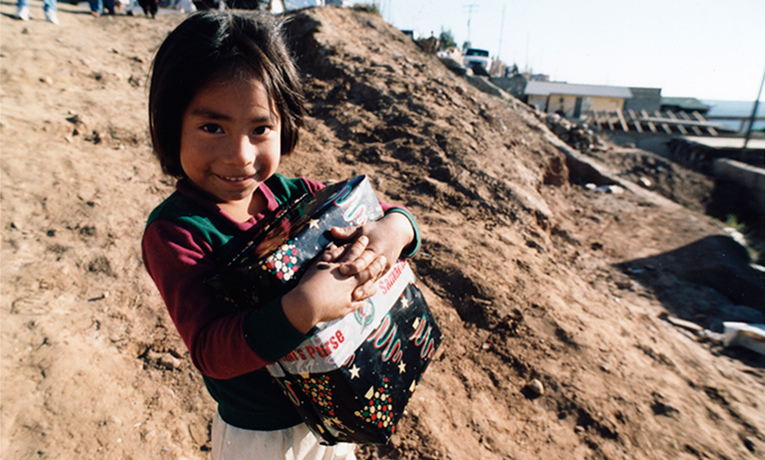 On the walk home, the children cradle Operation Christmas Child shoe boxes underneath their elbows. This was a special day at school, a day of surprises. Although the teachers had tried to keep it a secret, the children had found out that they would receive gifts, and they were excited. Before she received her shoe box, 8-year-old Joy listed the things she wanted. “School supplies … slippers … a pencil case … a pencil … anything that can be used for writing … and shoes.” She paused between each item as if she was afraid to say that she wanted more than one thing. Only after being prompted did she continue her list. Nine-year-old Ralph slowly listed what he wanted, too. “School supplies, school bag, a T-shirt, shoes and socks.” All of these are simple things that most American children take for granted. But in impoverished areas like this one, school supplies and basic clothing make a huge difference. “Education is the only way out,” said Marlin, pastor of the church that arranged the shoe box distribution at the school. “OCC will make a difference for them.” With new school supplies, the children will have more opportunities in class. But the shoe boxes don’t just offer physical items to make life better for children. The gifts also present an opportunity to learn about the Gospel. That’s exactly what Ralph did. When he accepted his gift, he also accepted Christ. As he kicks a soccer ball to a friend, his smile isn’t just because of his new toys. Now he has found God’s love. Ralph and his friends were offered “The Greatest Gift of All” booklet with their gifts, which explains the story of Christ and salvation through Him. Ralph said he is excited to learn more about Jesus. He is blessed because his mother is also a Christian, and she taught him about Christ even before he believed. Joy also received the booklet, but she didn’t look at it as soon as she received it. She said she wanted to look at it later. When she reads “The Greatest Gift of All,” there is hope that she too will find Christ’s love. At the end of the day, the smiling faces at the dump pick up their last bottles and throw them into bags. Then they walk the short distance to their houses. Children have finished playing soccer and are helping to prepare the evening meal. Over dinner, they will talk about their day at school. Parents will see every gift in the shoe boxes, and they, too, will hear about how Jesus loves them.